In many ways, where to put a gun safe is more important than which gun safe. Finding the best place to put a gun safe gives you better security, without spending more on the safe. This article will help you balance convenience with protecting your guns, and keep you from choosing a location that actually puts your guns in more risk. It also describes how to anchor a gun safe. This is the fifth article in the series What You Need to Know Before Buying a Gun Safe. The best place to put a gun safe is a compromise between convenience/access and protection. Less convenient locations generally offer more protection. This table summarizes your options for a gun safe location. Below the table, detailed descriptions explain each option. 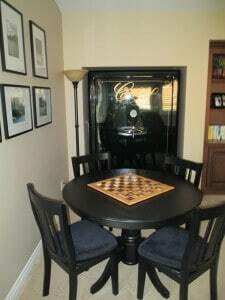 As you can see from the table, different gun safe locations offer varying protection from moisture, theft, flood, and fire. Before thinking about a location, it’s smart to figure out what risks you’re most concerned about. Nationally, the biggest risk by far is burglary, followed by floods, and then home fires. If you live on high ground in wild fire country, your risks will be different. This page has more detail on how to figure out which factors pose the most risk to your specific situation. The best location for a gun safe in your home will be a compromise between theft, flood, fire, and convenience/access. Great locations for one type of threat are often worse for another. Good location – the subject of this article. First let’s look at installation, because that may narrow down the choices. Path to move the gun safe in – this may limit the size and weight of your gun safe, so you need to measure beforehand. Floor that can support and anchor the gun safe – see below. To level the gun safe – see below. To bolt down the gun safe – see below. Electrical connection – for a dehumidifier and lights inside your gun safe. This may save you money in the long run. A great location is useless if you can’t get your gun safe there. Due to their weight, moving one presents a risk of injury and damage to your home and the gun safe. If you want to install a gun safe yourself, safety needs to be your highest priority. You’ll need at least two strong people for the job. Keep all children, pets, and non-essential people away from the area, preferably out of the house. Remove as much of the weight of the gun safe as you can. Disassemble and remove the interior. You’ll be taking it out later anyway for room to work when unbolting it from the pallet, and bolting it down. The door of your gun safe will be a large portion of the total weight. If the door of your gun safe is removable, depending on the distance and obstacles in the path for installation, it’s not a bad idea to remove the door. Rent the proper tools for the job, at least a moving dolly or heavy-duty appliance dolly. Be mindful of the ground pressure of the dolly wheels. Small diameter hard rubber dolly wheels will be supporting the entire weight of the load on a small area. This pressure may damage ceramic tiles, hardwood, or vinyl flooring. Lay down sheets of plywood or other material to spread the load and protect door thresholds. More than three stairs will require special equipment, more men, and professional experience. The gun safe must dimensionally fit through all doorways and stairwells. Don’t buy one that’s too large to move in. Structures are rated by two types of weights: dead or static loads and live loads. Live loads, like people, move around and are much more restricted than dead loads. Fortunately a gun safe weight is a dead load. Generally if a gun safe is to be installed on an upper floor the weight should be kept to 1000 lbs or less. Many floors will hold significantly more, but this needs to be established by inspection prior to purchase. If you’re buying a safe more than 1000 lbs, you’re probably going through a safe dealer who can do this for you. To calculate the load bearing capability of your floor, you’re going to need to know the effective size, type/material, and spacing of the floor joists. Note what’s important is effective size. Over the years it is not uncommon for floor joists to be notched out improperly (on the top or bottom instead of the middle) for HVAC, plumbing, and electrical work. If your 2 x 10 floor joist had 3″ notched out of the top for a bathroom remodel, that joist is now effectively a 2 x 7. On masonry exterior houses, the wood floor joists may be notched down a couple inches to fit over the outside brick ledge. Once you have the dimensions you can consult a carpenter, or use an online calculator, to get the load capacity of your floor. The floor surface is important too. A hard floor surface like hardwood or concrete is better for security than carpet, especially if there’s a thick carpet pad. A hard surface will make it more secure and harder to get a prying tool under. Compressing the carpet pad when bolting it down can improve things, but the carpet pad could always be scraped out for a prying tool. If your floor can support less weight than the safe you had picked out, there are other options for that location. For example, maybe the floor of your home can only support 1600 lbs but you had your eye set on a 2750 lbs Brown B-Rate safe with a 2.5″ concrete amalgamate fire lining. You might go with the non-fire rated version, which only weighs 1010 lbs. Then you could use the money savings to install a sprinkler over the gun safe or your own fireproofing. Another brand with different specifications is another option. In the previous example, a Graffunder model with a thinner 1.5″ concrete amalgamate fire lining might meet your weight budget. See 100 Money-Saving Ways to Protect Your Guns for more ideas. Best Gun Safes includes models with different weight and fire protection options. You’ll need to level the gun safe before bolting it for a number of reasons. The lock and bolt work often will not work properly if the safe isn’t level. Over time this can lead to reliability issues. It’s no fun to have to call a locksmith to open your gun safe. If the gun safe isn’t level, the door may open itself or slam shut. Neither is good and can really hurt you, or your guns. If this happens on a true safe or vault door, it can take off your fingers. The safe and door can get racked out of alignment if not leveled. Don’t try using bolts in the anchoring holes as improvised leveling feet. Concentrating all the weight of your gun safe on small bolts is not good for your floor, and not as stable as it should be. Shims are the only way to go. For the reasons covered in the previous article, a gun safe needs to be bolted down. To do that the pallet needs to be removed, as shown in this video. If you still don’t think you need to bolt your gun safe down, notice how easily one guy can move around a gun safe, or roll it with just a piece of 3/4″ plastic electrical conduit. Always use 1/2” bolts or larger to secure your gun safe. It’s best to bolt down all four corners. If you’re restricted to two for some reason, place the gun safe up against the back wall and install the rear two. That way if someone does get leverage under the front of the gun safe, they can’t tilt it very far. 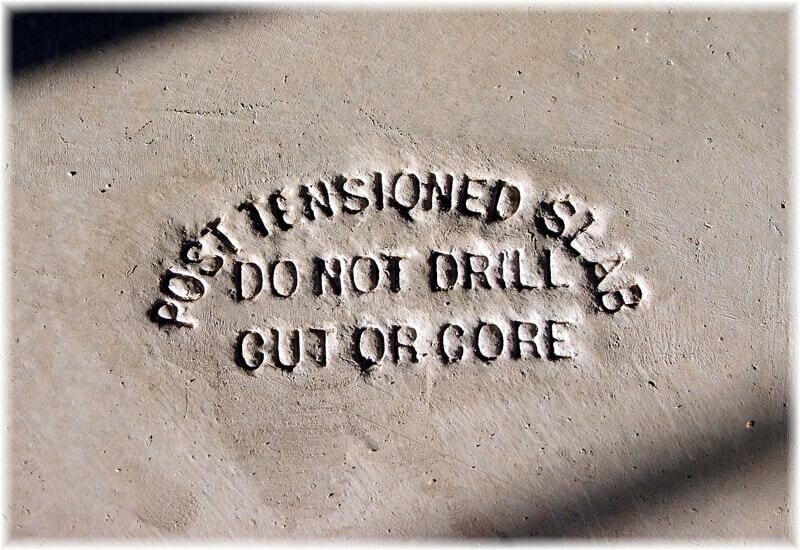 Be aware of anything in your floor before planning to drill into it. There may be water pipes, sewer pipes, forced hot water heating pipes, HVAC ducts, wires, and a myriad of other things under your floor. Some houses have radiant floor or ceiling heating. The concrete layer that the heating pipes run in might make an excellent anchor for a gun safe, but if you drill into one of the pipes it’s going to cause a lot of problems. For bolting down a gun safe, concrete slabs are best. Concrete releases moisture though, which will corrode the bottom of your gun safe. It’s a good idea to put a hard rubber mat like a horse stall mat or another moisture barrier under the gun safe between the concrete and steel to avoid corrosion. Another option is to epoxy seal the concrete before installing the gun safe, or use both sealing and a mat. Some people use hockey pucks to space the gun safe off the floor and allow air to get underneath it, running the bolts through the hockey puck. However, any method used to space the gun safe off of a concrete floor is more secure if you can block the exposed gap under the gun safe. This will prevent any would-be thieves from getting pry bars underneath. You will waste an excessive part your life if you attempt to drill your slab without a hammer drill. The bolts for your gun safe will require a hole too large, and too deep, to drill with just a masonry bit and traditional drill. Borrow or rent a hammer drill, or pay the installers to do it. This is a case where you really do need the right tool for the job. Due to the moisture concrete gives off, anchors should be at galvanized/zinc-plated at a minimum. Stainless steel isn’t necessary, but it’s not a bad idea. Here are some types of bolts you can use to secure a gun safe to concrete. Make sure you use a hammer drill to drill the holes or you’re in for a long aggravating day. Female types of anchors, like lag bolts and drop-in anchor shields, can’t be installed with the gun safe in place. They also make bigger holes in the floor. The benefit is that with the bolts removed, there will be nothing sticking out of the floor. Tap them into the holes. They need to sit below the surface of the concrete. It will be easier to install the bolts in the gun safe if you set the shields in the concrete before moving the gun safe back. Place a spare short bolt, or piece of “all-thread”, through a large washer or piece of scrap plywood or metal. Thread the bolt into the shield by hand. Tighten the bolt or nut to set the shield into the concrete. Verify the bolt/nut torques up and will hold tension. When you’re done, remove all the bolts and give the floor and shield holes a quick vacuum. When you have to move the gun safe, just remove the bolts and nothing will be sticking out of your floor. You can fill the female anchor shield holes with cement or epoxy. Installation is easier with a male type of anchor. Male anchors can be installed directly from inside the safe without having to move the safe again. Two types are useful for installing gun safes. The major drawback of male anchors comes if you have to move the gun safe. First, you will need to lift the gun safe straight up off of the studs to move it. Then, removing the studs from the floor won’t be easy. Male anchors are not made to be removable. Cut the stud off at the surface of the concrete – this can also work with #1, in which case you cut the stud flush. Then you can pound it below the surface of the floor and fill the hole with cement or epoxy. Yank it out – the studs are stronger than the concrete, so this will rip a hole that then needs to get patched up. 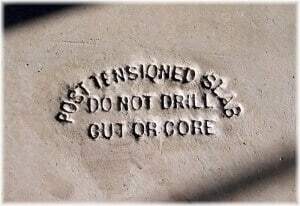 If you don’t drill the holes deep enough, you may be forced to do this. It’s very important to put the nut on the end of the male anchors before you pound the anchor studs in. Hitting the stud with a hammer can damage the threads and make it difficult to get the nut on later. You don’t want to be bent over in the back corner of the gun safe trying to chase the threads with a 5/8″ die and no holder. Wedge and strike anchors are available from home improvement stores by asking for concrete anchors. They charge a lot for them at these stores, but you’ll be able to see what you’re buying and buy small quantities. You can get them online through the links above, and at industrial supply sites like McMaster-Carr, MSC, and Grainger. Be careful ordering anchors online, they come in many different sizes. When you buy the anchors, make sure to buy large, thick washers with each anchor to make it harder to tear the bolt out of the bottom of the safe. Make sure you get an appropriate length of anchor that will extend at least 5 diameters into the actual concrete (2.5″ for 1/2″ bolts). Too short and the anchor will not set at all, or rip out of the concrete. Excessively long bolts will stick up too far into your gun safe. The right bolt length will depend on many different factors, including the type of flooring and gun safe fireproofing. Mounting a gun safe with no fireproofing directly to an epoxy-sealed slab will require the shortest bolts. If you have hardwood floors or ceramic tile over your concrete slab, that will require longer bolts. Also, check the gun safe fireproofing — whether it is cut out for the bolt holes, or uses bolt guides. Don’t forget to add the thickness of a horse stall mat or other moisture barrier if you’re using one. 4.5″ to 6″ in length is right for most gun safes with gypsum drywall (Sheetrock) fireproofing. Higher end models with different fireproofing may need longer bolts. When bolting a gun safe down into a wood framed floor, it is best to bolt the safe down directly into the floor joists. Anchoring a gun safe into only a plywood subfloor using 4 bolts will be much weaker; these bolts can be ripped out just by prying and/or rocking the safe. If you can get access to the floor joists from underneath, you can bridge the joists with a piece of lumber and screw the gun safe into that. If you cannot get access to the floor joists underneath, this may mean that the location of the safe will be partially dictated by the location and spacing of the floor joists. The weapon of choice for securing a gun safe to floor joists is the lag bolt in 1/2″ or larger size. Lag screws have hex heads which allow you to install them with a socket wrench. You’ll need that torque to install a screw of this size. A slotted or Phillips head is not going to cut it. Drill a pilot hole first to make installing the screw easier and reduce the risk of splitting the wood. Put some soap or oil on the screw too to make it easier to thread them in. Don’t forget a large washer washer for each bolt. Where anchoring to floor joists is not possible, there is another option–albeit more complicated. Instead of four bolts secured into the joists, you can use many more screws (dozens) to spread the load. Because most gun safes have only four anchor points, you’ll need a simple fixture in between the gun safe and the floor. You’ll screw the fixture into the floor, and then bolt the gun safe to the fixture. If you can not make this fixture yourself, a machinist can make one for you. Choose a thickness/material for the fixture plate. The thickness should be at least five threads of your gun safe anchor bolts. For softer materials like aluminum, go even thicker. For DIY, aluminum will be easier to work with, and lighter. For example, a coarse thread (UNC) 5/8″-11 bolt has 11 threads per inch, so five threads is 0.455″. Five threads of a 1/2″-13 UNC is 0.385″. Your plate will need to be at least this thick. You or your machinist may have some old metal plate laying around. Some supply shops like Metal Supermarkets cater to small retail jobs. A larger local metal supply store may also have some scrap they’ll give you a good price on. To keep this project cheap, use what is available of the right thickness. Cut the plate to size (if you have the tools), or have the supply house/machinist do it. A size larger or equal to the base of the gun safe is best. This will prevent a burglar from getting a crowbar between the floor and the gun safe. Mark the plate for the gun safe anchor bolts. Drill and tap these holes for the bolts that will hold the gun safe down to the plate. Determine the anchor bolt length you’ll need. The bolts need to be long enough to go through the washer inside your gun safe, the bottom of the gun safe, any leveling shims, and then at least three thread-thicknesses into the plate. If you’re using a weaker material like aluminum, five thread-thicknesses is better. For example, your 5/8″-11 bolts need to go at least three threads or roughly 0.28″ into your plate. Let’s say your washers are 0.11″ thick, the anchor holes in your gun safe are 0.27″ deep, about 0.10″ of shimming is needed, and you’re using a 1/2″ thick steel plate. You need bolts at least 0.76″ long (0.11+0.27+0.10″+0.28″). But if the bolts are longer than 0.88″ (0.11+0.27+0.5″), they’ll stick through the plate into the floor. So, 3/4″ (0.750″) long is a good choice. Or, you can custom cut bolts you already have. Drill the plate for the screws that will be used to secure the fixture to the floor. Put a screw hole every 4 to 8 inches around the perimeter of the plate like you were screwing down ceramic backer board. Then stagger more holes inside the perimeter on a similar spacing. Countersink these holes so that the installed screw heads don’t stick up above the plate. Determine the proper screw length for your floor. The right length will depend on the type of flooring you have. Screw the plate to the floor. Set the gun safe on the fixture and line up the holes. Install the anchor bolts and washers inside the gun safe. Gun safe manufacturers only recommend bolting the safe down to the floor for a few reasons. The wall (and gun safe) may not be completely plumb. Bolting it to both the wall and floor may tweak the gun safe body and cause the door and/or locking mechanism to go out of alignment. Putting holes in the wall and its fire insulation can reduce the fire rating. Floor mounting bolt holes are in the part of a gun safe which will be the coolest in a fire. This is the best place to have holes in the fire insulation. Bolting the gun safe to the wall isn’t always practical because of baseboard trim. Spacers would need to be put behind the safe. Spacers will make it easier to put prying devices between the gun safe and the wall. The surface of the floor or the subfloor is generally a hard material like hardwood or tile, but the wall is made of weak drywall. Bolting the gun safe to drywall means that a pry tool can be jammed in. Nearly any tool will destroy the drywall, leaving a 1/2″ or larger gap to pry the gun safe off the studs. Compare this to a floor-bolted gun safe where there is no weak material to attack with a pry tool. If you have a post-tensioned slab, or other floor surface that you can’t bolt into, you can build an anchor, walls around it, or another creative strategy. If you’re out of options, bolting it to the wall is better than nothing. Remember the goal is to make a burglar waste as much time as possible. A gun safe that takes too long to open or is located too far away to be convenient will rarely get used. Convenience and access to your gun safe are critical in your location choice. If you have a difficult to access gun safe, you may leave valuables or firearms in other locations, defeating the whole purpose. Most people who buy gun safes find that they quickly run out of room. On the other hand, some get a large gun safe that will only fit in a distant location. Then they find that all the extra space is wasted due to inaccessibility. The purpose of this website is to keep you from wasting money, so I’m hoping to prevent either problem from happening to to you. How often do you plan on using the gun safe? Do you carry concealed and want to store your carry gun in the gun safe every night when you get home? What else will you put inside? Do you want to use the gun safe to lock up your daily medications from your kids? Figure out how frequently you’ll want to get in your gun safe, and err on the side of more often. Whenever choosing a location for your gun safe, it’s important to out-think burglars and other risk factors–but do not out-think yourself as well. For the safe to get used, it has to be convenient. Overly complicated hiding procedures and long distances between your common living areas, cleaning and gunsmithing areas, and vehicles will probably cause the safe to fall out of use over time. Humidity protection in particular is one of the most important for most parts of the USA. More gun safes will experience moisture problems than burglaries, floods, and fires. Gun safes are enclosed and will tend to average out humidity and temperature fluctuations in the air. You can assume that the humidity and temperature inside the safe will be roughly the same as outside the safe. That means that climate-controlled locations are better for protecting gun from humidity and temperature. Slabs and other heavy architectural items with large thermal mass will also help stabilize the temperature of a gun safe. Garages and basements are generally not climate-controlled and can be the worst locations in this respect. Many basements are damp and will add additional humidity, which is a killer of guns. Upper floors of homes tend to be hotter in the summer if there is no climate-control. Locations near heating stoves and fireplaces are subject to more temperature fluctuation and radiated heat. More ideas for addressing moisture were included on this page, including airing out your fire lining after installation. Gun Safe in Dining Room is visible to most people who come in the house, and probably adjacent to the kitchen, the largest source of fires. Burglars target the master bedroom and closet first, followed by offices, garages, and other random locations like refrigerator freezers and ovens. The fewer people that see the gun safe the better. This is true for decoys as well, as you don’t want your decoy to put your main safe at risk. Living rooms and other rooms where guests, casual visitors, and service people come frequently are higher risk. Any location where a gun safe can be seen through your doors or windows from outside of your house adds risk of theft. For this reason, outside walls in between windows and upper stories are usually better than interior walls and lower stories. Statistically thieves generally don’t target basements, which makes them a low risk location for theft. Also a basement gun safe will usually have to be dragged up a flight of stairs, which is a deterrent to stealing the safe. Thieves are more than happy to throw a gun safe down a set of stairs (and ruin your home), but then gravity does the work. Unfortunately basements often have workshops in them, and anywhere with tools nearby makes it easier for a thief to break into a gun safe. So, the flight of stairs might not help. 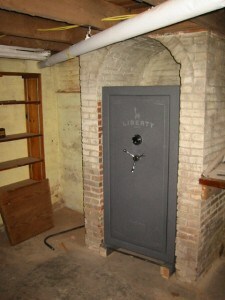 This gun safe owner installed his gun safe in a basement fireplace foundation so that the sides are concealed by brick. The brick offers a tremendous amount of protection to the side walls if the gun safe is bolted down. However, it looks like it’s still bolted down to its pallet but not the floor, so it can just be tipped forward and hacked open. If he did bolt the pallet down, there’s still a large gap under the bottom of the door frame. This gives room to allow all kinds of prying tools or a car jack in there to bust out any bolts. You could even jam a 4 x 4 in there! Finally, if the gun safe were recessed a couple inches farther back into the brick it would make it much harder to get a pry bar in the door. This safe has internal hinges which only swing 90°, so recessing it wouldn’t block the door swing. Gun Safe in Bedroom Closet. Unfortunately this is one of the first places burglars look for valuables. Gun safes in garages have advantages and many disadvantages. Most garages have concrete slabs which make excellent surfaces to bolt down to. They’re also not in the very first places burglars look for valuables. In a garage a hidden gun safe, for example in a refrigerator, would probably never get noticed by a burglar. On the other hand, most garages aren’t temperature controlled, or even insulated. Mother nature and rust can do damage to your guns quickly in many parts of the country. Another risk is that every time the garage door is open, people can see what’s inside and case out your stuff. Garages are also a place which usually has tools. Tools nearby make breaking into a gun safe easier. While not the first location on a burglar’s list, garages are a place thieves specifically go to look for tools to steal. In the process they may stumble upon the gun safe. Garage doors are relatively easy to attack through the emergency release, with garage door openers, or cutting or peeling the door. Garages unfortunately give great access for thieves to back in vehicles, which can even be used to wrap a tow strap around a bolted-down gun safe and rip it out. 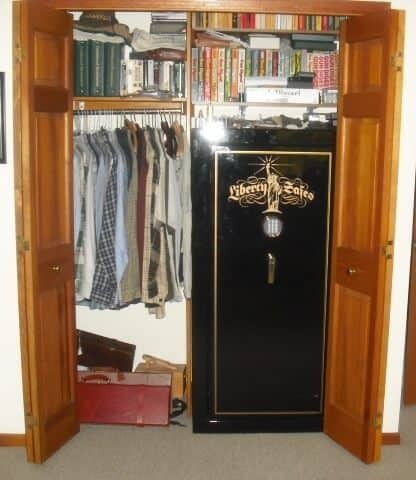 Closets are one of the best locations for gun safes. This is especially true of coat closets and closets in rooms other than the master bedroom and office. A huge benefit of closet installations is that they offer protection to the sides of a gun safe, provided the gun safe is bolted down and can’t be tipped over. 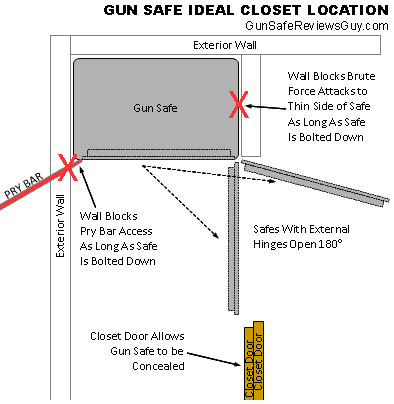 This figure shows an ideal closet location for a gun safe. Its location against the exterior walls makes it harder to see the gun safe through the windows. Against the exterior walls, it will also stay cooler in a fire. The closet door allows the gun safe to be concealed when it’s closed. If the closet door can be locked, even better. The walls on each side help block the gun safe walls from brute force attacks, as long as the gun safe is bolted down. Because the gun safe door opens against a wall, it’s very difficult to get a pry bar in the door, as long as the gun safe is bolted down. Even if you don’t have a closet like this, just mounting your gun safe in an exterior corner like this is a benefit. Building a small wall on the remaining side will increase the theft protection of a gun safe tremendously. Wherever you mount a gun safe, make sure the gun safe is under 6″, or over 18″ from a wall. Gaps between 6″ to 18″ will allow a car jack or other tool to be used to rip the gun safe’s anchor bolts out. Easy question, obviously the higher the better. How high above grade you need to be depends on your area. Be as conservative as you can. Even if a river doesn’t overflow, you want to be above grade in case the basement floods. A sump pump may fail. In an emergency like “Superstorm Sandy”, electricity may be out for a few days. 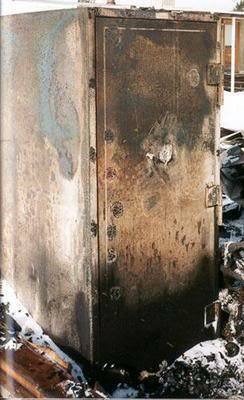 Gun safes are safest from fire damage when located farther away from common fire origins, especially the kitchen. Any room which opens to the kitchen, or is located on an upper floor above the kitchen, is at risk for fire. Locations below the kitchen are also at fire risk from firefighting water damage and the kitchen collapsing down in a severe fire. Rooms where people smoke, burn candles, or that have heating stoves or fireplaces have higher fire risk. Outside walls have lower temperatures in a fire than inside walls. You can see this in pictures of severe fires where parts of the exterior walls are still standing, but all of the interior walls have been destroyed. In general, the higher a gun safe is in a home, the hotter it will get in a fire. Gun safes on the second floor are at higher fire risk than on the first floor. Remember that gun safes are very heavy. If the fire is bad enough, a gun safe will fall through the floors down to the lowest level. True fire safe ratings have a standard test for this scenario. During the initial stages of a fire, the basement will stay one of the coolest parts of the house. However, if the fire gets bad enough the rest of the house will collapse into the basement, as discussed in Myth: Basements are most protected from fire. There the burning mass will either continue to burn, or the basement will fill up with firefighting water. After severe fires often the basement is such an unrecoverable mess, that whatever remains of the house is bulldozed and back-filled into the basement. Garages and other locations may have nearby fuels which place them at higher risk. Gasoline in lawnmowers and other equipment, paint thinner, chemicals, lumber, and other materials are often stored in garages. Depending on which fire origin statistics you look at, garages may not be at the top of the list. Fire origin statistics however include fires in apartments, condos, townhouses, and houses that don’t have a garage at all. All homes have a kitchen but not all have a garage, so garages are probably an underrepresented fire source. Most building codes require special fire rated wall construction between a garage and a home, which reflects the risk of fire in a garage. 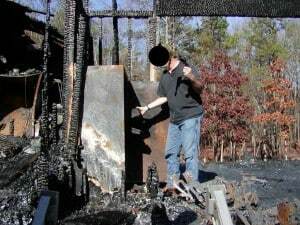 Exterior walls are best gun safe locations for fire protection. 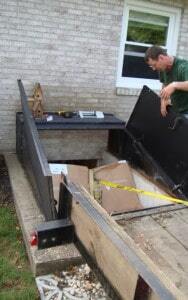 Gun safe locations on slabs are safest in a fire, followed by first-floor locations above crawl spaces. 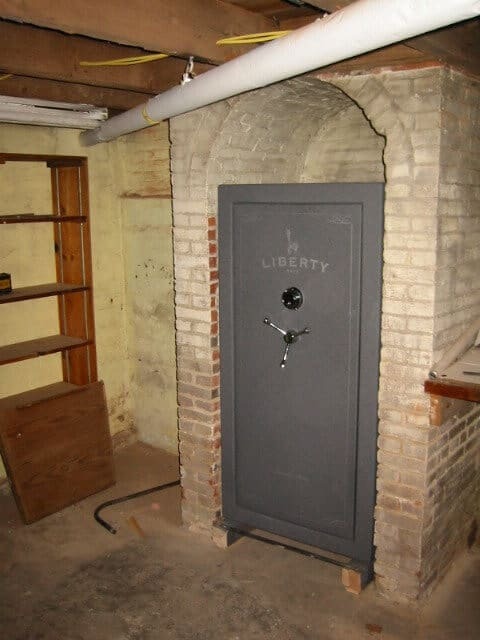 Gun safes on floors above basements are at risk of falling into the basement and suffering significant impact, fire, and water damage in a severe fire. If all of your first floor is over a full basement, then an exterior corner as far as possible away from the kitchen and other common fire origin locations would be the best protection from fire. Gun Safe after Home Fire. The top of the gun safe gets the hottest. Inside a gun safe, the top of the safe will be the hottest in a fire. The bottom of the safe is at the highest risk of flood and water damage, but the lowest risk in a fire. Most gun safe owners store handguns at the top of the safe. Due to the risk there of fire damage, a location in middle of the safe would be better. If your gun safe is too crowded for this, put your least valuable handguns at the top and your more valuable handguns in the middle. Don’t put flammable materials inside your gun safes like ammunition, cleaning chemicals, aerosol, cleaning patches, etc..
As covered in Myth: Ammo is safe inside a gun safe, don’t put your ammo in a gun safe. If you insist on putting ammo in, put it in the bottom. The bottom is the coolest and lowest risk of rounds cooking off and damaging your guns. Also ammo is relatively waterproof, so in less risk during flooding. Most handgun safes are cheaply made and not very secure. For this reason, handgun safes should be hidden out of sight for security. There are an infinite number of ways to conceal and secure a gun safe. A number of hidden gun safes and diversion gun safes are included in the Buyer’s Guide. If you’re handy, more ideas for how you can build a closet gun safe, hidden gun safe, hiding spot, or many other options are covered in 100 Money-Saving Ways You Can Protect Your Guns. A wall gun safe is deceptively easy to attack, because it can easily be ripped out of the wall. Wall gun safes should be hidden behind pictures, mirrors, or located in closets. If you’re considering between a wall and a floor safe, the floor will be more secure from theft, but less less convenient and harder to conceal. For security, small gun safes must be bolted to something. They’re too portable and easy for a burglar to take with them. This will also reduce the effectiveness of bumping attacks on electronic solenoid locks. Storing loaded weapons in holsters inside a handgun safe is a good idea for safety. You may have to access a handgun safe in the dark or from an unusual position, requiring you to reach inside blindly. A couple handgun safe models include integral holsters to present the grip to you upon opening the door. For fire safety, keep loaded guns pointed in a safe direction inside thinner handgun safes. A chambered round which cooks off could endanger your loved ones or firefighters, if the handgun safe walls aren’t thick enough to stop it. This is a special consideration for revolver owners. Fortunately most self-defense ammunition is designed to fully expand upon contacting a much softer target than steel, limiting penetration. Small gun safes are best located at least 5 feet off of the ground. This makes stomping or kicking a handgun safe open much more difficult, but is especially important for those with children. Just like avoiding burglary, the more time and effort you can force a child to waste to reach your guns the better. Block any holes to a small gun safe you can. Many small gun safes come with numerous mounting holes. Most also have spring-loaded latches, which can be compromised by poking something like a paper clip around in the locking mechanism. Any holes that you do not use should be blocked by placement of the safe or plugs/bolts. Now that you have a location picked out, it’s finally time to look at gun safes. Let’s review What to Look for in a Gun Safe, the next article in this series. Another idea for bolting a safe to a wood floor is to block the joists (perpendicular placement) with 6×6 or 8×8 lumber, then secure the safe with 1/2″x8″ lag bolts into the timbers. This distributes the upward force placed on the bolts by a “tipping attack” along the surface of the timbers where they contact the sub-floor, and where they’re nailed into the joists. This essentially forces a burglar to rip out the sub-floor, at least until the bolts fail. But the bite on an 8″ coarse thread lag bolt into a dense wood species would require a a good deal of force to defeat, especially times four. That would do the trick, Ben. Gotta be the best way to secure a safe to a wood framed floor, if you have access to the joists below. Thanks! I changed the door to my hall closet at the same time as my front door – made for security, and locks just like the front door. The gun safe is wedged in so it cannot be tipped – or removed without spending a lot of time. This might not be for everyday use but if you are going to be away from your house for several days a BurglarBomb(AB-2000) seems to be a good add on. Its a trip wire OC spray dispenser. If your safe is in a closet hook the trip wire up on the inside of the closet door. If it gets set off the burglar wont be able to see b/c of the OC spray. It will also cut into his safe cracking time 🙂 I think these are a really good add on to a monitored alarm system. There are also high-tech OC alarms with motion sensors and what not but they cost a lot of money. My main contingency concern is rounds cooking off in a fire; I want them contained. I don’t care so much about recovery. We live in Pittsburgh city, 4 kids: 6, 12, 14 and 16. Plan, at this point, is to put smaller ammo safe in basement, corner of house (my workroom); long gun safe near it, and small handgun safe bolted to underside of bed. Myth-busters did the rounds cooking off myth and only put them inside of a standard household oven, the only round that even cracked the front glass when it went off was a 50 bmg. so inside a safe you should be just fine. Thanks Terry. Looks like I missed that comment. Todd, as Terry pointed out — rounds cooking off (which are not chambered in a gun barrel) won’t have enough energy to pierce most storage containers. The main concern with ammunition in a fire, is the damage which it will do to other objects stored inside the same storage container (e.g. guns). More discussion of that can be found at Myth: Ammunition is protected in my fireproof gun safe. Thanks Todd & Terry for reading. 1. The screws uses to hang external doors are generally what comes with the hinges and door hardware and are extremily short. Replace all the hinge and hardware screws with 3-3 1/2 screws (preferabily hardened). These will go into the framing around the door. 3. Place motion sensor light switches in hallways, stairwells and normal traffic areas. If a burglar gains access to your house, a light going on as they are walking around puts put them on notice that some one in the house may have heard them (and maybe using their gun safe for one of its intended purposes..
Wow, I had no idea there were so many factors when deciding where to put a gun safe. I’m planning on calling an installation service to install a safe in my house. I think I’ll put it on the second floor to avoid damage from floods. Thanks. Any recommendations on where, in terms of home layout, to put a small wall safe that will be specifically for a handgun in the event of a home invasion? I am installing two safes and assuming one will go in the master. I’m trying to decide where the other should go? Close to the front door? In the middle of the house? Any thoughts are greatly appreciated. Personally, in a home invasion I’d prefer to have a gun holstered on my belt. I know that’s not what you’re asking but I thought it was worth mentioning. I don’t feel qualified to give a reliable answer on this, but with that said I’ll take a swing. Reading hundreds of Armed Citizen reports, I’ve kept some ballpark mental statistics. From those stories, the majority of in-home attacks seem to come via doors. Another common type of incident is actually outside, either in the yard, the neighbor’s yard, an animal attack, etc. For in-home attacks, assailants seem to knock and/or try one or more doors before starting to break in one. When the location of the retrieved gun is described, it is often in a bedroom, followed by somewhere close to the resident (couch side-table, holster, etc.). Of course, that doesn’t say much about the relative effectiveness of different locations, but does start to sketch out the scenario. I’d recommend posing that question to someone who does tactical training, especially for this type of scenario. Someone like Rob Pincus, Grant Cunningham, etc. Poking around on Rob’s site I found this video on home defense, which makes some good points. It sounds like his recommendation would be to put the second safe in an alternate barricade location. In other words, somewhere like a finished basement where your family spends a lot of time, or could reliably escape to if you couldn’t get to your bedroom. This of course will depend on your floor-plan and family. Based on the video, the bedroom may actually be a pretty good location for a weapon in a home invasion. It naturally causes the would-be-victims to run from the threat (Evade) to a more defensible location (Barricade) before addressing the assailant. This buys time and distance to the attacker. Let us know what you figure out. 1. My defense pistol is on my hip all day, even in my home, and within easy reach on my nightstand at night. Same with my wife (we sleep in the same bed… :-). Both pistols have a tactical light with laser mounted. 3 feet away from my bed is a 12 gauge shotgun loaded with 8 rounds of 00 buckshot. 2. I have 4 Chihuahuas who can hear an ant fart across the street. If anyone tries a doorknob, breaks a window or even walk on the porch, all hell will break loose with loud barking; this will give us enough lead time to be ready for any invader. 3. The Chihuahuas are a great alarm system, but the bark of our Doberman would be my “deterrence” system. Get a dog or two. 4. Still have to decide where to install my safe for my other guns/rifles. Mostly questions and no answers.